Alright. This post has been more than a year in the making. Today, I’ll cover how I installed the KAOSS Pad touchscreen controller in the body of the guitar. This is one of the last steps of the final assembly! Below, you will find step by step instructions for the final wiring also. If you have any questions, don’t hesitate to post them or message me. Somewhat late in the game, I realized that I would need a way to turn the LED lights on and off. This includes the illuminated hold button, as well as the KAOSS Pad LED illumination. This is a simple SPST switch from Radioshack. It has a very small footprint, and fit well in the switchplate. To install the SPST switch, I had to drill another hole in the control switchplate. Above, you can see the hole, circled in red. This location allows the switch to be placed out of the way of the other controls. I ended up wiring the switch to power both the LED pushbutton, and the LED touchpad light, in series. That means the power (from the battery pack above) flows to both lights at the same time. In this picture, you will see that I used the modular jumper wires, as in the last post, to make this a plug and play design. Here’s a link to the battery pack I used. The LED pushbutton is rather straightforward. There is one terminal for positive power, and one for negative. I soldered color coded wires for easy identification (note the modular wires for quick attachment). Click here for a link to the pushbutton I used. At only $6, it really wasn’t a bad deal! Pretty cool, eh? This is the pushbutton, with some power flowing through it. Note: I’ll show how to connect the hold button a little later. Also, in this picture, you can see the LED light that I’ll use to illuminate the touchpad. Here’s a shot of both the pushbutton, and the LED power switch, installed into the guitar switchplate. And here it is all powered up! This is the LED light that will be used to illuminate the touchpad. As with the pushbutton, I soldered a red and black wire that will connect to the switch and battery pack. You can see the ends of the wires running into the control cavity. Here’s a link to the programmable LED light that I used. You can get these for about $12, from a variety of online stores. It’s time to insert the wiring harness, detailed my previous post, into the guitar body. As I mentioned previously, a female to female RJ45 coupler will be used as the primary IO jack for KAOSS Pad Touchscreen data transmission. I shaved it down, slightly, to better fit the hole I routed. 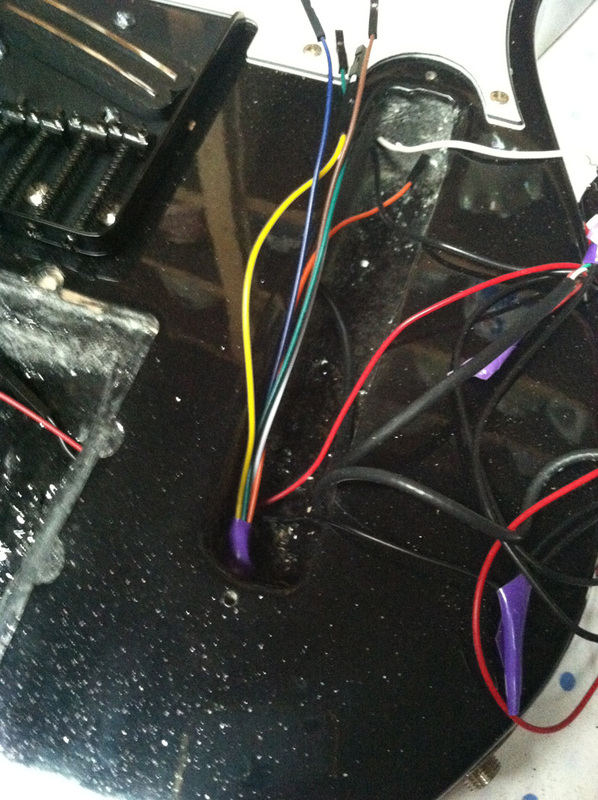 This is a shot of the wires, from the wiring harness, routed into the control cavity. I’ve been remiss, in failing to completely document my fabrication of a faceplate, to secure the RJ45 jack in the guitar body. Above, you see a stock photo of the product I purchased (click here for link). This is a metal, wall mount, faceplate that I cut to size using a Dremel with a cutting wheel. Here’s where my documentation picks up. This is an intermediary shot of a trimmed down keystone faceplate. Here’s the faceplate, cut to size. Note: the edges are still very rough, and will need to be sanded down using my trusty Dremel. Here’s the faceplate after a bit more TLC. Note: I still need to drill the screw holes. After that, I will spray paint it black. Now that a lot of the odds and ends are just about done, it’s time to install the touchpad! In this picture, you can see how I ran the modular wires, from the KAOSS Pad touchscreen, into the control cavity. Here, you can see the wires passing through into the control cavity. Remember, I color coded the wires, so it should be easy to match up the touchpad wire ends, with the wiring harness matching ends. And finally, here it is all together! Note how well the fabricated faceplate fits on the KAOSS Pad touchscreen! Here’s a link to my post showing you how I fabricated the KAOSS Pad touchscreen mounting trim piece. Looking nice and shiny! Also, by taking my time in initial fabrication, I was able to ensure that there are absolutely no unsightly gaps in this installation. Time to complete the “hold” button. This particular button allows you to wire either “normally closed” or “normally open” positions. In this case, we want to wire “normally open” This means that a press of the button closes the circuit of the two attached wires. I soldered one hold button wire to the “common” terminal, and the other to the “normally open” terminal. Once this is done, tape them up, and connect them to their matching ends from the wiring harness. Wow, what a rat’s nest of wires! Note to self: it’s going to be a real pain, trying to fit this all back into that small control cavity! Time to hook it up and test the KAOSS Pad and hold button functionality! Again, this uses standard CAT5 network cable that you can get just about anywhere. Proof of life! After powering everything up, I first tested the hold button. Note the illuminated hold button on the base unit (bottom left). It works! Pressing the hold button again, turns it off! Next up, testing the touchscreen. Note the digital readout of 1.1. This denotes that origin XY values of the touchscreen. Each value has a range of 1 through 9. It’s the small things that make me happy. Here you can see the X value increase to 9 gradually, as I slide my finger up the touchpad. This is something you haven’t seen before, a fully functioning Y axis test! After fixing a loose connection, the Y axis now registers 100% correctly. Note the “9” in the Y axis display position above. And last but not least, here’s a shot of both values increased to their maximum, at the same time. This is more than a year’s hard work, validated in one fell swoop! Note: the next one won’t take me nearly as long, and will be even better! And here it is, after everything is put back together. Here’s a shot of the LED lighting powered up. You can’t see the touchscreen illumination very well from this angle, but the hold button led is clearly visible. Here’s a the money shot! This is the illuminated KAOSS Pad touchscreen. As I mentioned in a previous post, this is a programmable color shifting LED light. This is the touchscreen, after the LED color-shifted to blue. I have this LED programmed to run through a cycle of white (uncolored), red and blue light. Here’s another view of the hold button. If you look closely, you can see the power switch at the top of the control plate. Here’s the completed KAOSS Pad jack mounting plate. This is spray painted, and is very prone to scratching and smudging. At some point, I may coat this in a layer of lacquer, or even do a DIY powdercoat. That’s it for today! Next up, putting on the neck and doing any final adjustments that may be necessary.